Few topics in science evoke more wonder than the idea that there was once a great prehistoric civilization now lost to history, whose scant remnants are presented in breathtaking revelations by independent scholars insightful and brave enough to think outside the box of mainstream archaeology. Most prominent among those who promote this view is Graham Hancock, author of The Message of the Sphinx, The Mars Mystery, Underworld: The Mysterious Origins of Civilization, The Divine Spark, Sign and the Seal: The Quest for the Lost Ark of the Covenant, Fingerprints of the Gods, and now,Magicians of the Gods. This latest work, at over 400 pages, expands upon his earlier books, all of which are oriented around his belief that a worldwide civilization existed more than 20,000 years before present (BP). What happened to this advanced culture? It was wiped out by a planet-wide cataclysm that Hancock now suggests was triggered by a comet strike on the Earth, as evidenced by many geological features he thinks have no better explanation than a massive flood caused by the comet impact that erased nearly all traces of this advanced civilization. This initiated the Younger Dryas period of intense cold, ca.12,900- 11,700 BP, followed by a disrupting period of gradual warming at the end of the last glacial maximum from 27,000-24,000 BP when, presumably, this ancient advanced civilization flourished. The Younger Dryas was followed by extensive flooding of the continental shelf land areas previously exposed due to falling sea levels during the glaciations. The flooding was caused by rapid warming of the entire planet at the end of the Younger Dryas. According to Hancock’s theory, flood myths across the world record the history of this event in mythic form, as does the myth of Atlantis. While the Younger Dryas may well have had a sudden onset, possibly measured in a few decades, and the rise in sea levels at the end of that period may also have been as sudden, there is no evidence of any civilization developing before the Younger Dryas. 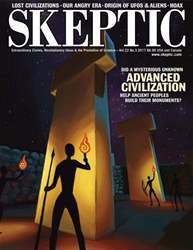 As this issue of Skeptic includes an analysis of the astronomical and geological aspects of the theory by geologist Marc Defant, I will here focus on myth and history as Hancock presents them in Magicians and his other books. To begin, according to Hancock, not all traces of this advanced ancient civilization were destroyed. As he has argued in previous works, for example, the Sphinx needs to be redated to make it part of this much earlier civilization, as does a pyramid buried at Gunung Padang, a megalithic site in Java. Hancock praises the work of geologist Danny Hillman Natawidjaja, who he sees as persevering in the face of hidebound scientists who want to stop his investigation because they fear the “truth” about the past. According to Hancock, a cabal of these dogmatic scientists petitioned to have Natawidjaja’s work halted, until the president of Indonesia heroically stepped in and put an end to their machinations.